Dehlia was Diomedes' first cria, and we were elated with her quality. She had copious amounts of tightly curled, bright, bundled fleece when she landed. As she matured, visitors to the ranch would Ooh and Aah over her beautiful fleece and frame. As you will note in the show results below, judges agreed with them. Marathon Monday was Dehlia's first cria, and she had the most spectacular fleece we've ever seen. 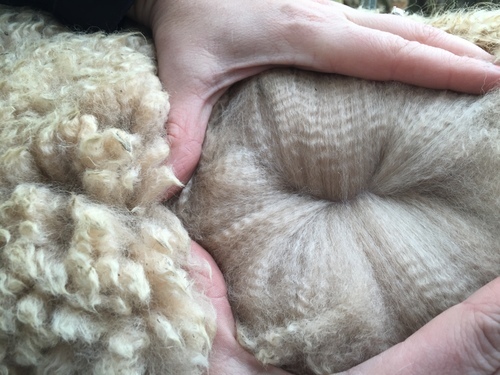 Her fiber stats on her first shearing were 12.4 AFD, 2.2 SD, CV 17.6, %>30 0.2 with a fine crimp and matchstick bundling. Monday is pictured with her male offspring, Hezekiah, from Aspen Ridge Augusto's Cochiti. Hezekiah is listed on our site as a Junior Herdsire, and his first and second fleeces have garnered blue ribbons...it is spectacular! Dehlia also produced a gorgeous male from Snowmass Perfection. He was all we had hoped for, and you can see more of him on his listing. She should have been bred every year, but like many farms, we held females open with the downturn in the market. This year, Dehlia birthed a male from our own Grazing Hills Colin. Colin's sire was Glacial Storm, so once again, we pulled from the Augusto line; this cria is another great example of what a stellar foundation female should produce. 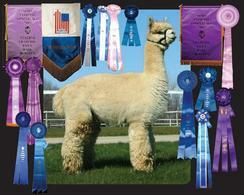 We showed Dehlia at Alpacapalooza 2008 where she took a Blue ribbon in the beige class of juvenile females. That same year at NW Showcase, she garnered another Blue and also the Reserve Champion ribbon at not quite 8 months of age. We would have shown her again, but she was ready to start her breeding career, and we decided that was an even better option. Dehlia produced another gorgeous cria in June of 2015 at 309 days gestation, Sweet Recollection!!! You can read about that experience on our blog...GESTATIONAL MICROWAVE. Dehlia is currently bred to our Ephraim and due June 2017. 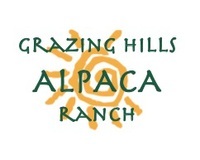 Since they are both extremely dense, this should be a beautiful cria! Monday puts out some amazing fleeces on her crias! But, she herself ALSO has a gorgeous fleece! Continual fineness over the years, and a heavy blanket weight each year, she is a fantastic female! She will be bred again to our Ephraim in Spring 2019. She was injured while being bred at another farm and has a hind leg that she walks funny on. It doesn't seem to inhibit her being bred or problems with delivery.